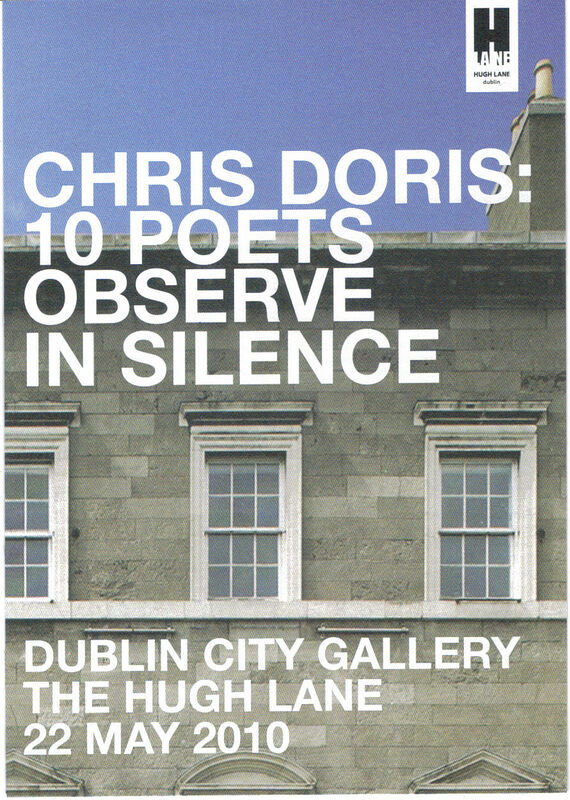 Chris Doris: ’10 Poets Observe in Silence’ at the Hugh Lane Gallery. Last Saturday (May 22) visitors to the Hugh Lane Gallery (Parnell Square, Dublin) met with an unusual sight: a circle of 11 people, sitting silently. Ten poets and an artist. Well, if thevisitors had come in at certain times (every 50 minutes) they would have seen one of the people strike a gong and then see the circle disperse, and then return punctually ten minutes later. Punctually? Poets? Is that possible? Yes indeed. Chris Doris, the creator of this artwork, had his poets well in hand. This ‘silent circle’ was the brainchild of Chris, an artist ‘who utilizes silence as a medium of shared public enquiry’ . Which means… Well, I was one of the poet-participants and I’m not sure I can explain exactly what was happening. For one thing, there was no ‘exactitude’ about it. I do know that it was a deeply affecting experience for me. Just alone on the level of being without TV, Radio, conversation, books, internet, surrounding chatter, mobile-phone, door-bell ringing– that is to say: without all the vicissitudes of ‘modern life’ — Being ‘away’ from everything for a few hours without any of these things was a unique experience. THAT was one important aspect of the silence Chris was constructing throughout the day, through which the participants one could see/experience something else about themselves, something not manufactured for them by their surrounding milieau. But to utilize this silence ‘as a medium of shared public enquiry’? I’m not good at explaining this because, although the experience allowed me to see into myself without the usual hinderance of my ‘cultural clutter’, I don’t know what effect the artwork had on visitors to the museum. Once one allows the silence to do its work, one gradually sinks (or rises?) to a plane where the surrounds are almost shut out. So therefore I was sometimes only partially aware of people coming and going, and of people sitting down with us for a while in the ring of chairs placed outside the circle. One lady, directly in my line of vision, stayed a considerable time. I wonder how she felt? Was the circle working for her too? In what way? What enquiries was she making of her self? … How one asseses this idea of ‘shared public enquiry’ I’m not sure. I hope to talk to Chris Doris again about all this sometime. He’s bound to help me out, as he did with us all the day(Friday) before the artwork. He has 20 years of academic and practical research in Eastern philosophy, Western psychology and science. That may sound a bit forbidding if you haven’t met him, but in fact he is very amiable and wears his learning lightly . The poets were Chris Agee, Paddy Bushe, Seamus Cashman, Patrick Chapman, Rachel Hegarty,Kevin Higgins, Eamonn Lynskey, Nuala Ni Dhomhnaill, Eileen Sheehan, and Barbara Smith. Thanks also to Rachel, who sat with us ready to catch anyone who fell over from all the mental exertion and bring outside for revival. Fortunately this did not happen. Despite rumours to the contrary, poets are tough birds! Next Post: Last Wednesday Open Mic: 7 Towers at Cassidy’s, Westmoreland St., Dublin, 26th May.